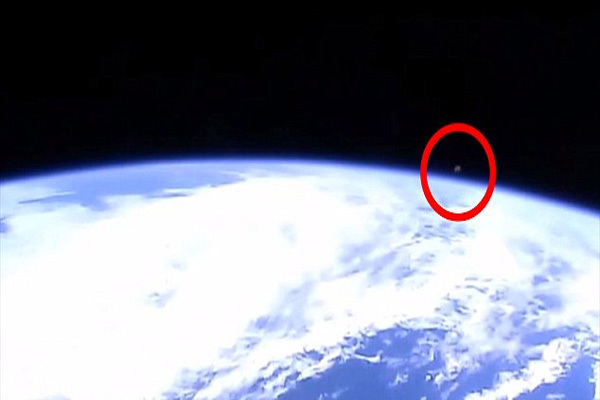 Conspiracy theorists have accused Nasa of cutting its live feed from the International Space Station whenever a ‘UFO’ appears. On two separate occasions this month, alien hunters claim to have spotted mysterious objects appearing on their screens before it goes blank. 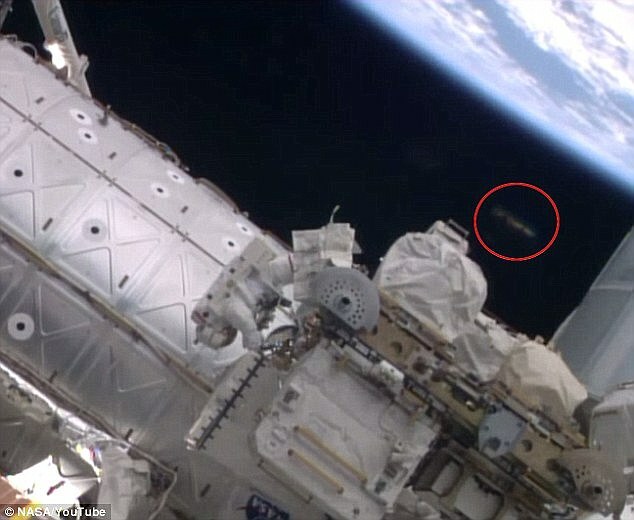 UFO watcher Toby Lundh recently spotted a UFO outside the space station, moments before the stream was interrupted for 10 to 15 seconds. 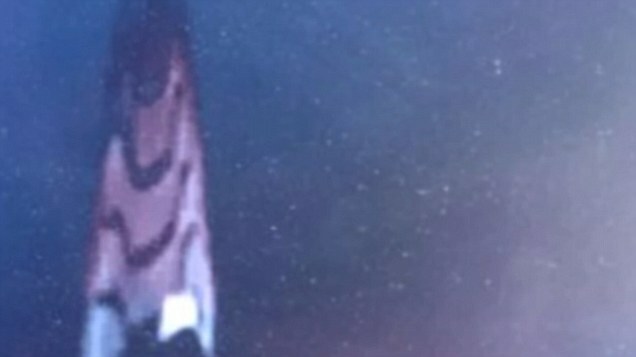 The alien hunter claims to have captured a still photo of the unidentified object from the feed – and it looks remarkably like the Starfleet insignia in Star Trek. In a separate incident last week, a grey object was seen coming up over the horizon and then disappearing moments before Nasa switched to a different camera. One possible is that it was a bit of debris that hit the lens, or even the moon. But ‘Streetcap1’, the YouTuber who posted the video isn’t convinced. ‘Please bear in mind that the moon appears white when it shows,’ he writes. Meanwhile on October 7, UFO watchers said they witnessed a strange object near the station during a spacewalk by astronauts Reid Wiserman and Alexander Gerst. The object was later identified as being either a speck of dust or a lens flare from the sun. That didn’t stopped some conspiracy theories arising though, with ufologists somewhat speculatively claiming it was proof that we are not alone in the universe. CAN YOU SOLVE SOME OF THE WORLD’S BIGGEST UFO MYSTERIES? In 1948, the US government launched several inquiries into UFO sightings, which many believed were sparked by Cold War paranoia. In what became known as ‘Project Blue Book,’ more than 12,000 encounters with UFOs were looked into by the Air Force. Now, decades after the files were closed, the microfilms have been made available online for free – allowing anyone to re-examine the evidence. The USAF says that the Blue Book included 12,618 sightings reports, with 701 of which remained ‘unidentified’ – or around 5.5 per cent of the files. The files, which can be accessed here, were previously only available by visiting the National Archives in Washington. NASA shuts down live video feed – was it because of UFO? Professor Andrew Balogh from the Imperial College London Department of Physics tells MailOnline: ‘Generally speaking UFO sightings are either explained by some artefact effect – even some space junk – or left unexplained as there is not enough evidence. Nasa is yet to comment the incidents. The space agency’s ISS live stream and rover photos have become a huge source of ‘evidence’ for conspiracy theorists. Many scientists believe UFO sightings such as this are down to a psychological phenomenon called pareidolia. This describes the brain’s response to seeing significant objects in random places. 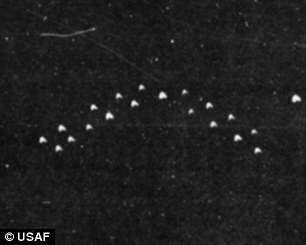 ‘The vast majority of these images are as vague and elusive as those posted by UFO witnesses on Earth, and many have a fairly mundane explanation, ‘Nigel Watson author of the UFO investigations Manual told MailOnline.